EBC Brakes™ GD series grooved replacement brake discs have wide aperture grooves that help to dispel dirt, dust and water while at the same time drawing cool air under the brake pad and disc contact area to help cool the pad contact temperature which can reach over 1000 degrees. 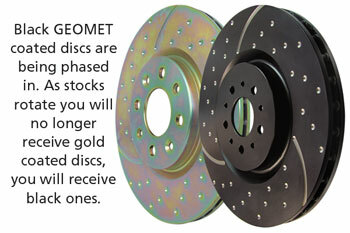 The EBC Brakes™ GD series grooved replacement brake discs run cooler and ensure flat and parallel pad wear which improves braking. Please be aware that these discs do produce a certain amount of wind noise. If you find this noise unacceptable, we recommend using either non drilled discs or USR slotted discs. All EBC Brakes™ replacement brake discs are thoroughly checked for runout. These discs are suitable for use with all EBC Brakes™ replacement brake pads but are particularly good when teamed with EBC Brakes™ Redstuff ceramic super street brake pads for faster street use.